TOUCH has announced that they’ll be making a comeback as a five member group with new members! 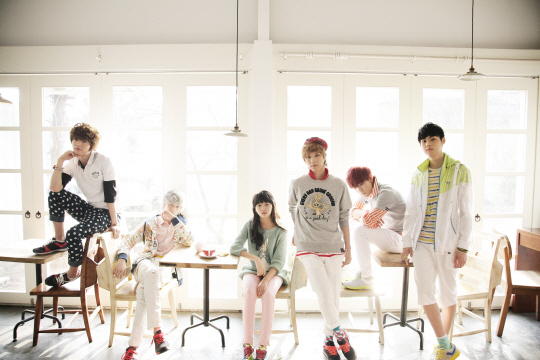 The group debuted in 2010 with “Me” and promoted actively with “Rockin’ the Club” last year. Gearing up for their next comeback, the boys have already completed filming the music video for their title track. Directed by Kwon Soon Ok, BoA‘s older brother, the music video features actress Kim So Hyun, better known for her role as the younger ‘Bokyung in the MBC drama, ‘The Moon That Embraces the Sun‘. TOUCH’s new title track is a sweet love story with a music video concept about a man planning a romantic event for the girl he fell in love with upon first sight with. For those in need of a refresher, Junyong and Younghoon departed from the group for reasons of military enlistment and family circumstances respectively. TOUCH’s comeback will take place next month. SHINee’s Key wants to kiss Han Ga In? On the April 12th broadcast of Mnet‘s ‘Beatles Code 2‘, SHINee‘s Key confessed to wanting to kiss actress Han Ga In! Last episode of ‘Beatles Code 2′ left off with SHINee writing their own ‘Kiss Notes’, where they wrote down the names of female celebrities they would like to kiss. After opening up the results on this week’s episode, the names Son Ye Jin, Lee Min Jung, and Han Ga In turned up. Comments Off on SHINee’s Key wants to kiss Han Ga In? 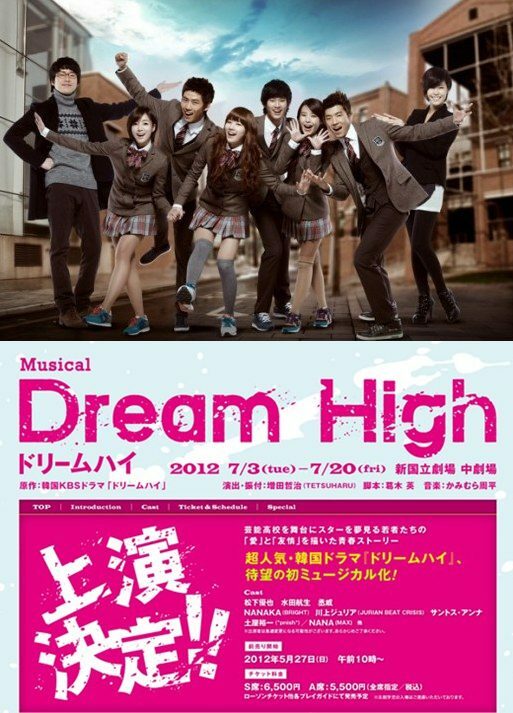 KBS2 drama series ‘Dream High‘ will be turned into a musical in Japan. According to a report released by a Japanese entertainment media outlet March 21st, KBS ‘Dream High’ season 1, which was first broadcast in January of last year, will be turned into a musical in Japan. The first performance is scheduled to take place at Tokyo’s New National Theatre on July 3rd, and the musical will be based off the hit drama series. The drama ‘Dream High’ was co-produced by actor Bae Yong Jun of ‘Key East‘ and J.Y. Park of ‘JYP Entertainment‘. The first season featured miss A‘s Suzy, 2PM‘s Taecyeon & Wooyoung, T-ara‘s Eunjung, IU, along with Kim Soo Hyun, Uhm Ki Joon, Lee Yoon Ji, and more. In Kim Soo Hyun’s case, his role in ‘Dream High’ was a stepping stone towards becoming a top star, seizing a role in ‘The Moon That Embraces The Sun‘ which recently came to an end. In the musical, the role of ‘Song Sam Dong’, which was originally played by Kim Soo Hyun, will be taken on by Matsushita Yuya, the youngest person to perform at Michael Jackson’s commemoration stage, and the role of ‘Jin Gook’, originally played by Taecyeon, will played by Mizuta Kouki. 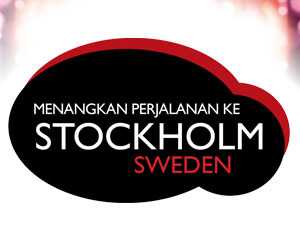 The musical will be put on from July 3rd to the 20th, and tickets will begin selling May 27th. A star-studded cast that is hard to find all together in a single movie. The international poster for Director Choi Dong Hoon’s movie, ‘The Thieves‘, was unveiled, boasting an impressive line up. 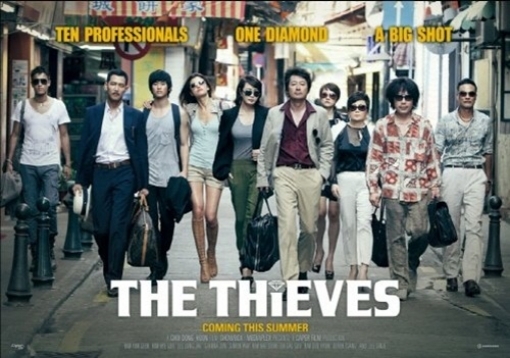 ‘The Thieves’ is about 5 Korean professional thieves who have never made a mistake. They are called in by their previous boss, MacauPark who has a sweet offer. So they, along with 4 thieves from China, travel to a Macau casino to steal a rare diamond called ‘the tear of the sun.’ The movie is scheduled for a summer release. Kim Soo Hyun teared up as he expressed his thoughts on the conclusion of ‘The Moon That Embraces the Sun‘. It’s these awkward moments that get our faces red and haunt us in our memories. As it turns out, celebrities also fall victim to these toe-curling moments, and they have the pictures to prove it. Kim Soo Hyun, currently the hottest young actor in Korea for his role in ‘The Moon that Embraces the Sun’, had such a moment in a fan signing event. At an event for sports brand Prospecs, Kim Soo Hyun was seen signing a card for a female fan. As he handed the card back to her, he reached out his hand to give her a handshake. For whatever reason, the fan failed to see the gesture and turned away, leaving Kim Soo Hyun hanging in mid air. He quickly made a fist with his lonely hand and sat back down. Netizens who saw these hilarious photos uploaded comments such as, “That fan just made the single biggest mistake of her life” , “So funny! That expression in the last picture really sums it up” and, “I wonder how she will react when she realizes that she missed her opportunity“. ‘The Moon that Embraces the Sun‘ had record viewer ratings for its last episode. According to the data compiled by AGB Nielsen Media Research, the last episode of ‘Moon-Sun’ which aired on March 15th had an average of 42.2% in viewer ratings, which topped its previous record and proved its explosive popularity once again. If that wasn’t impressive enough, according to another media research company, TmnS, the most popular moment/scene in the drama took place at 11:07 PM KST, with a whopping 51.8% in viewer ratings. The scene that drew in more than half the nation was the last kiss between Hwon (Kim Soo Hyun) and Yeon Woo (Han Ga In), as they listen to Hyung Sun (Jung Eun Pyo) play the gayageum (traditional Korean stringed instrument) at Hidden Moon Court. Jung Il Woo coped with the sadness from the conclusion of MBC‘s ‘The Moon That Embraces the Sun’ with Kim Soo Hyun and Song Jae Rim. The picture revealed was taken on the set of the drama at the location of the final shooting. Jung Il Wo, saddened by the thought of ending his work with Kim Soo Hyun and Song Jae Rim, took pictures to keep as memories. Jung Il Woo and Kim Soo Hyun play love rivals on set, but off set they are close friends who are the same age. It is already well known that when Jung Il Woo is on set with Kim Soo Hyun and Song Jae Rim, the laughter never ends. Jung Il Woo has received much praise for his acting by playing Prince Yang Myung ,a broad minded man with a bright personality, but longs for the love of one woman. ‘The Moon That Embraces the Sun’ aired its final episode this week. MBC‘s “The Moon that Embraces the Sun” has finally come to a close with it’s record breaking viewer ratings on March 15th. A slew of photos from the set of the final days of shooting have been released in honor of the drama’s successful closure. The photos prove as evidence of the close bonds that were formed amongst the cast members. In particular, the first few photos are from Kim Soo Hyun, Jung Eun Pyo, and Jung Il Woo‘s last day. The three musketeers of the drama Hwon (Kim Soo Hyun), Hyung Sun (Jung Eun Pyo), and Woon (Song Jae Rim) are found holding a long embrace in tears. The three actors were the viewers favorites as their teamwork was fantastic both on and off screen. A couple photos titled, “This right here is a high fashion pose~!! 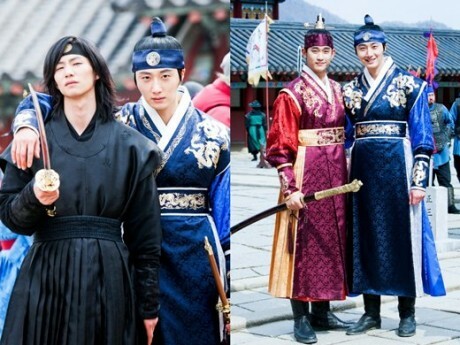 !” showed the silly trio posing in unison during the filming of Hwon’s wedding. Find video coverage of each actor’s final goodbyes on the official website.